Have you ever used a particularly great app and thought, wow, I wish I had this on my computer? No? Well, now you can anyway. Kidding aside, the applications for the new BlueStacks App Player are pretty enormous: more than a simple Android emulator, it allows just about any Android app to run full-screen on a Windows computer. Even more compelling, users can sync selected apps between their computer and their phone or tablet. The uses today aren’t all that obvious. After all, Android is a touch-based environment, whose support for precise mouse and keyboard input is sometimes tenuous. 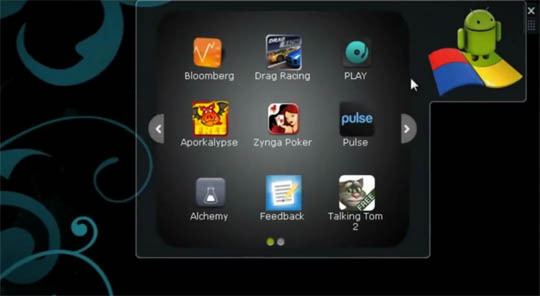 But as touch interfaces find their ways onto more and more full-sized machines, the usefulness of BlueStacks will increase. Consider that with the BlueStacks App Player installed, the touch-enabled all-in-ones from Dell and HP instantly become 20-inch+ Android tablets capable of running Honeycomb apps… all without affecting the flexibility and power of Windows. Think about it: if implemented correctly, an $800 Windows 8 tablet could have access to hundreds of thousands of touch-based apps on day one. Unfortunately, BlueStacks doesn’t have direct access to the Android Market. Instead you download apps from the company’s database or “push” them from your phone or tablet.The service is still in its early stages and does not have paid apps or an OS X version. The company is focusing on games and RSS reader-style apps and marketing its software directly to computer makers, no doubt hoping that a built-in selection of Android apps will help spur consumers as more and more Windows-based tablets hit the market. You can download the early version of BlueStacks for free right now.